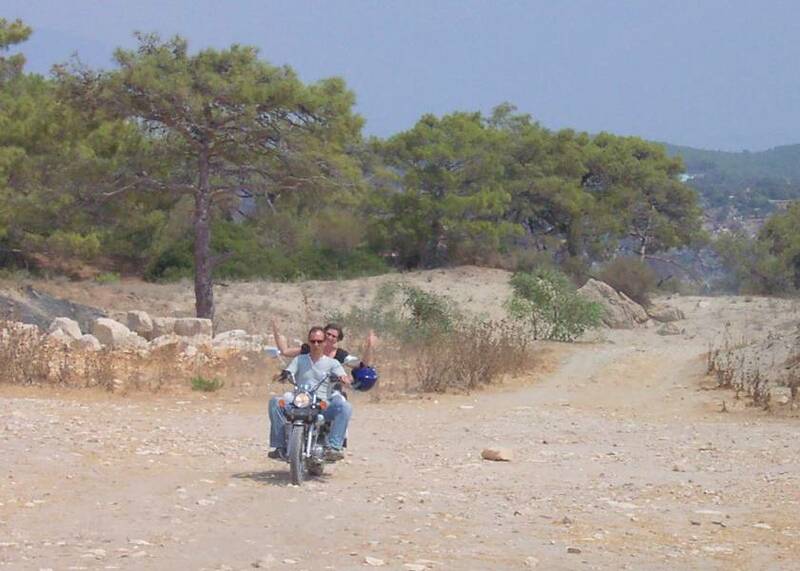 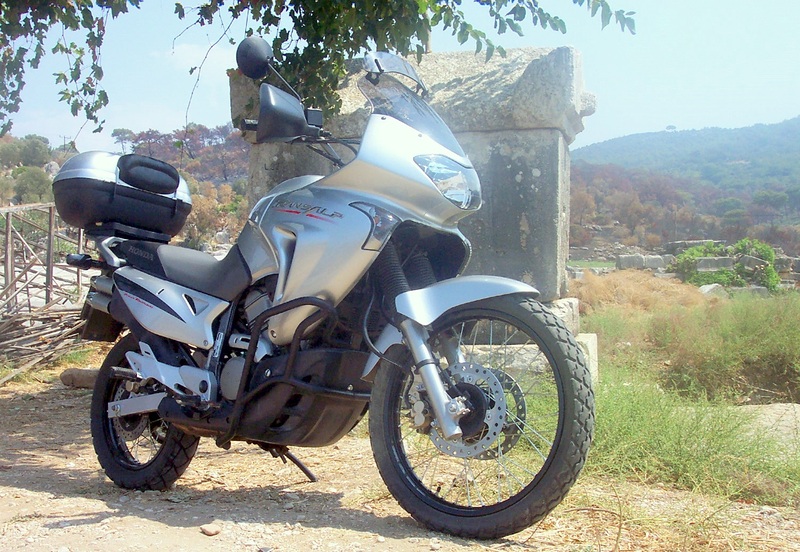 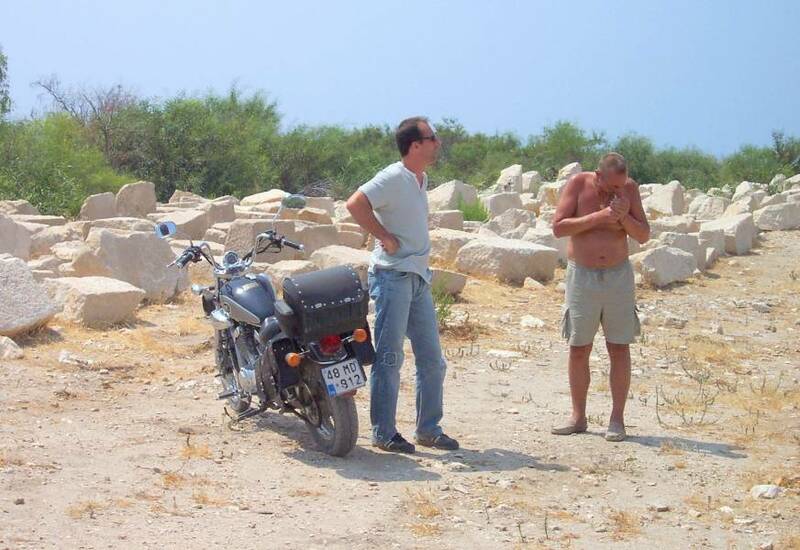 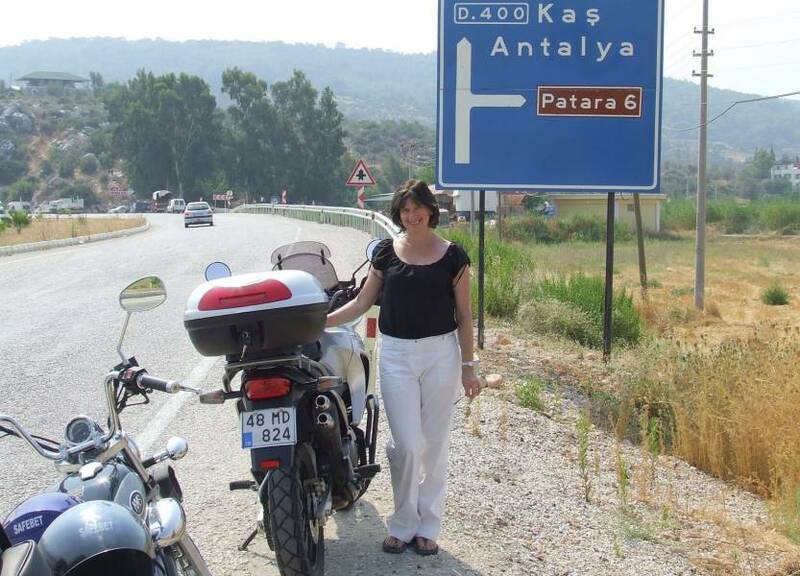 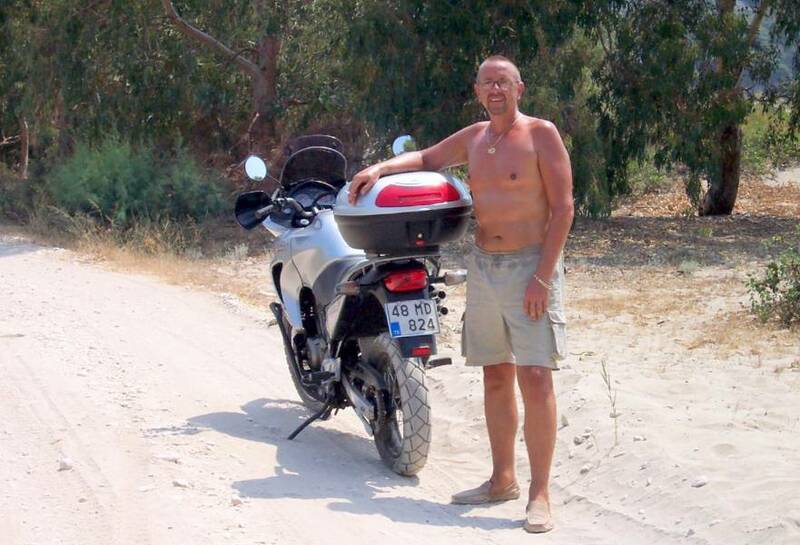 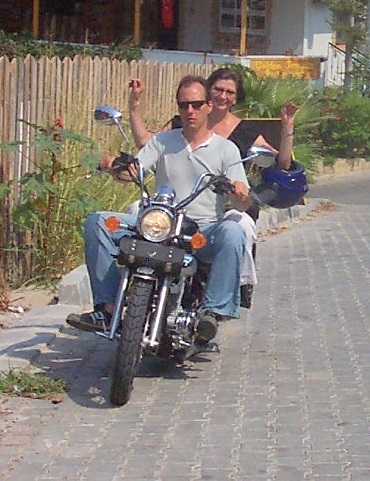 A ride out with Ian and Bev to the ancient ruined city of Patara. 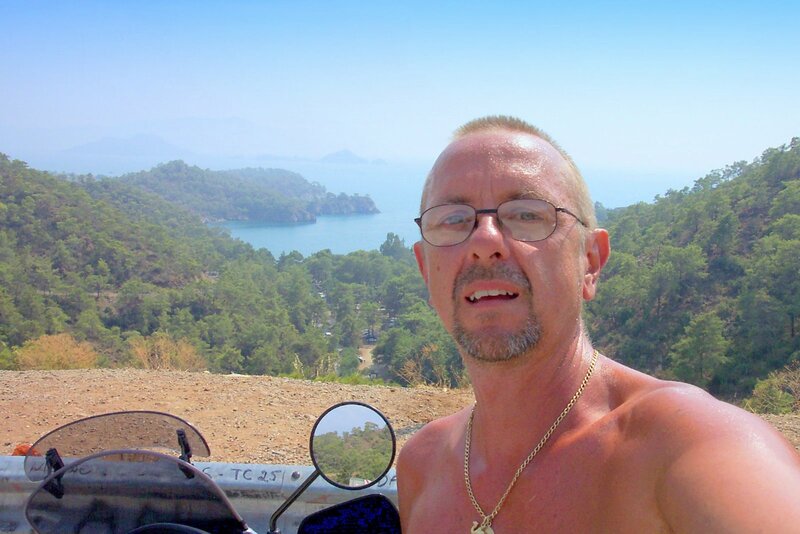 By the time it was late morning the temperature was in the low 40’s centigrade, it was hot on the bike even though I was just wearing a vest and shorts. 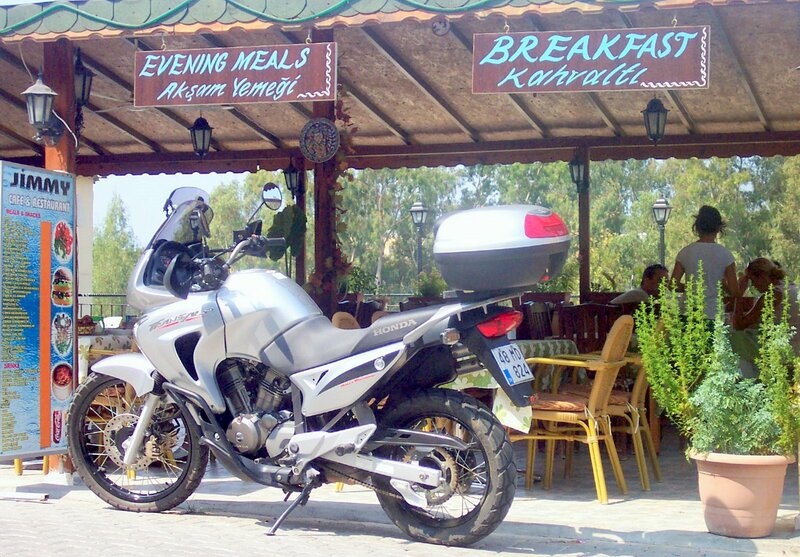 We stopped for lunch at a cafe in Patara that had very convenient parking. 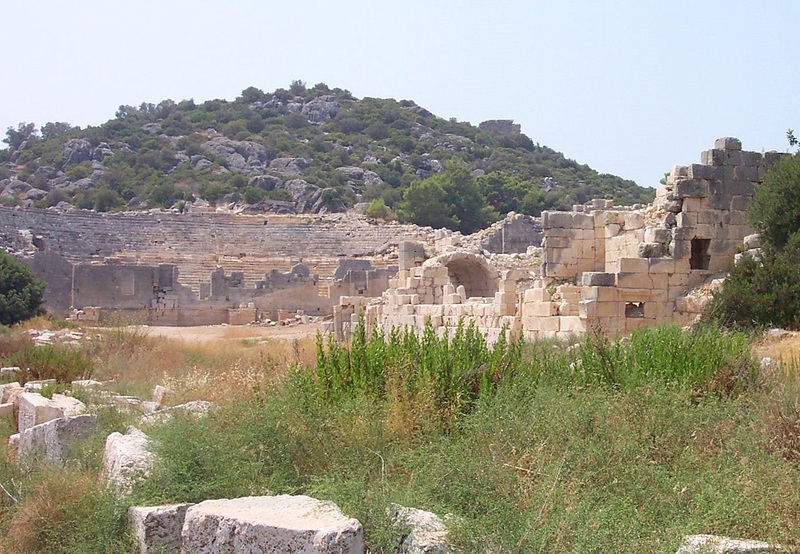 After lunch it was about 5km from presant day Patara to the ruined city, there is a small 3 lira addmision charge to enter the large site. 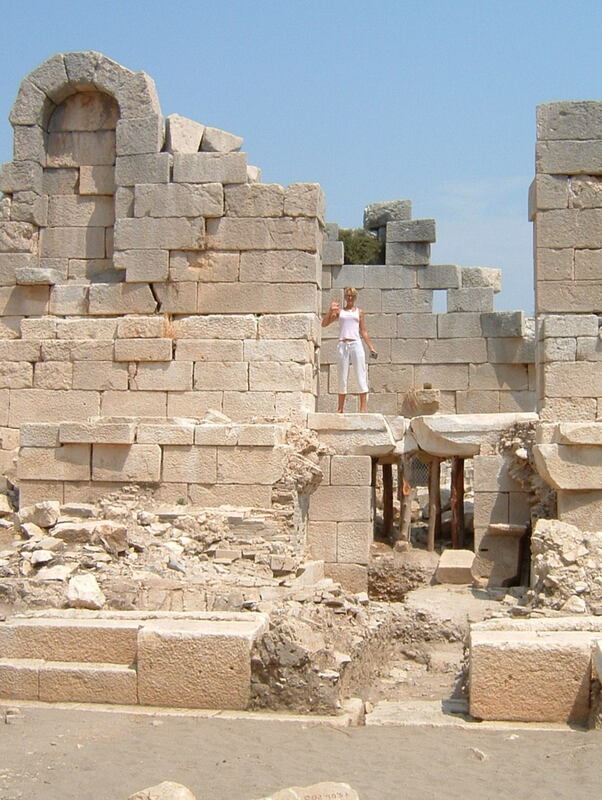 The enterance gates to the 2500 year old city of Patara. 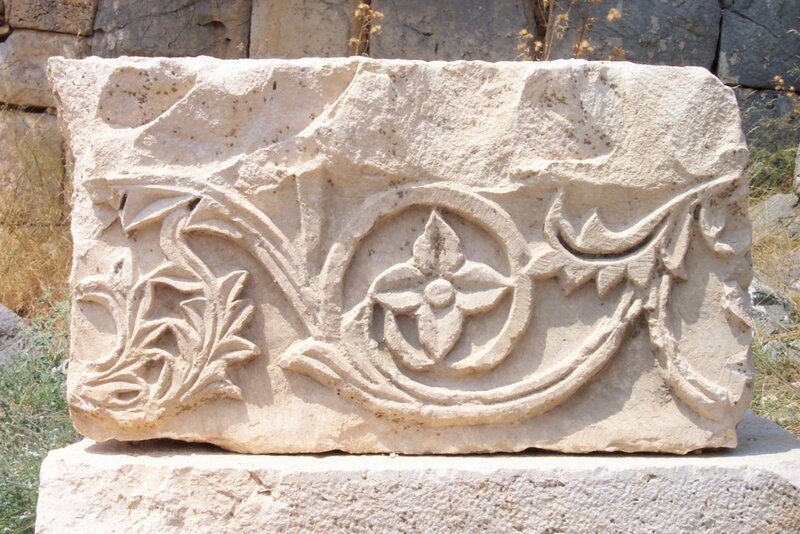 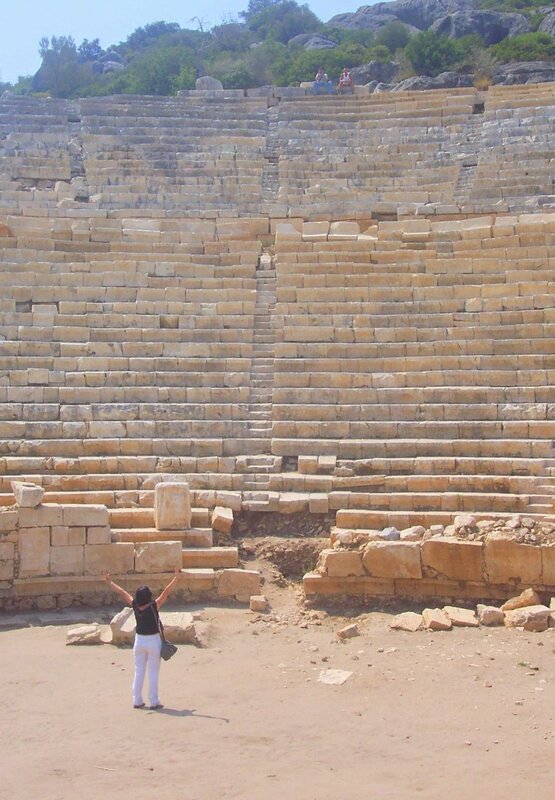 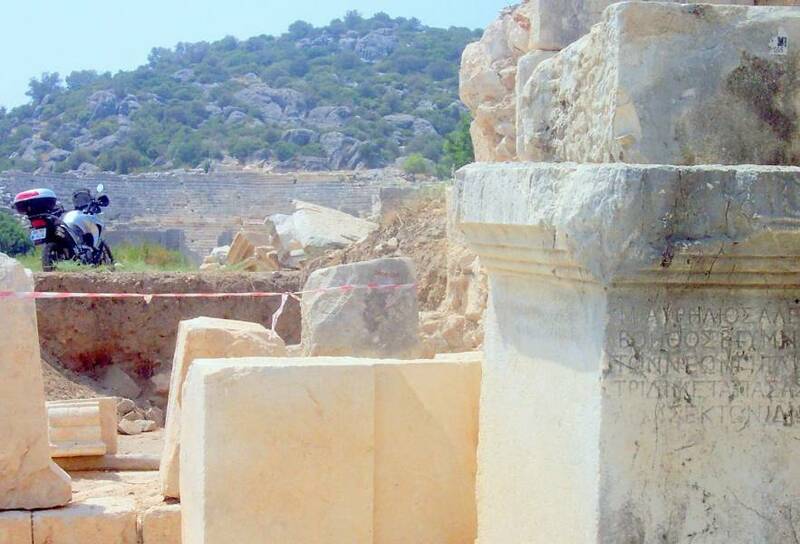 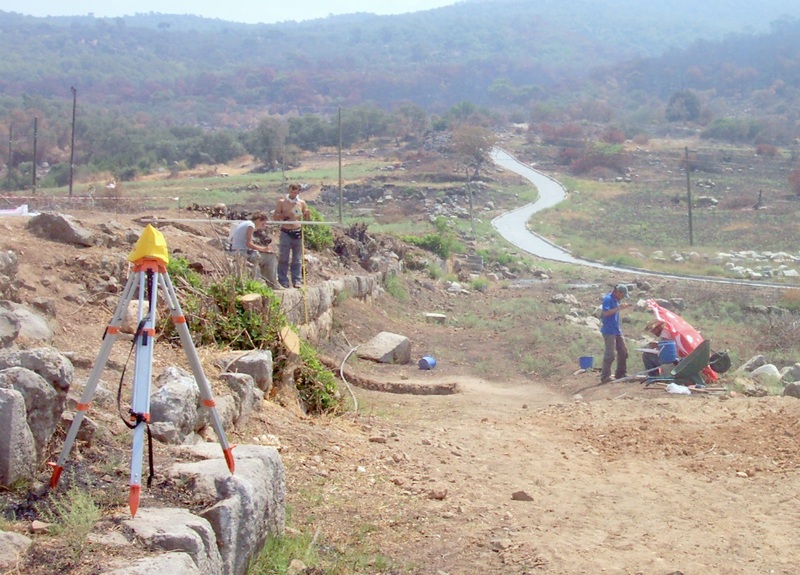 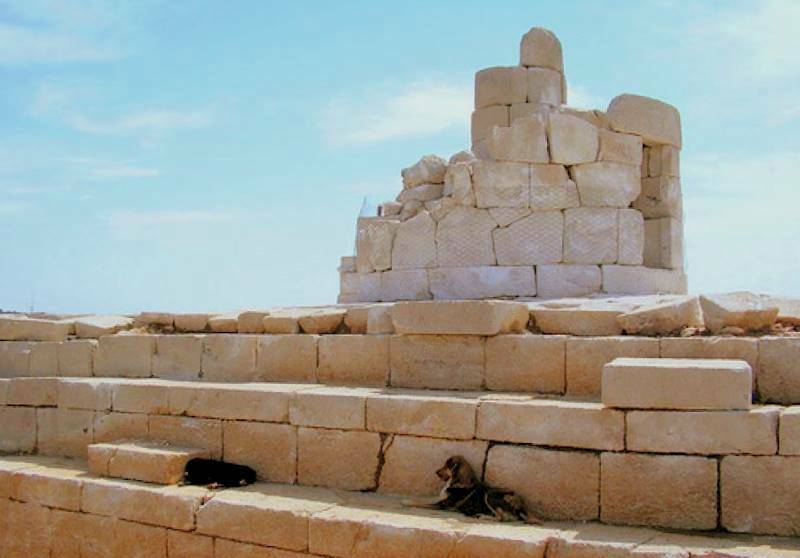 A team of archiologists were conducting a survey, Patara is only 15% excavated due to it’s large size. 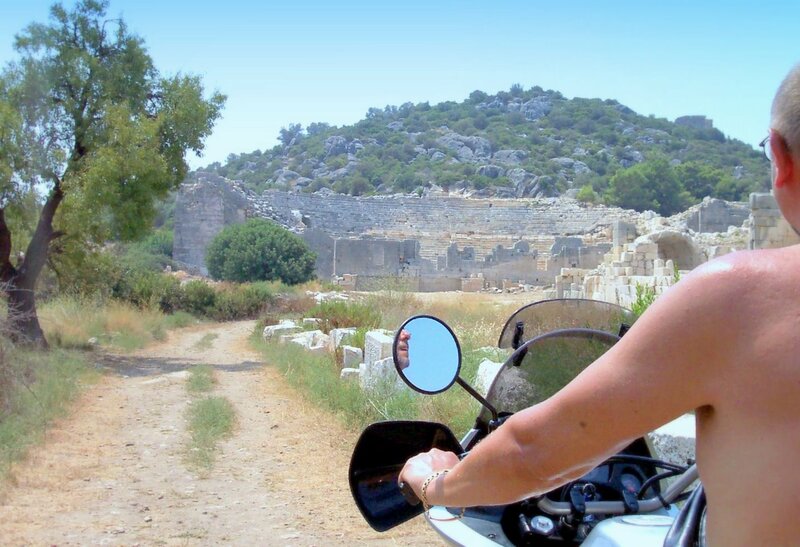 We parked up near some ancient tombs for a ciggie and a wander around. 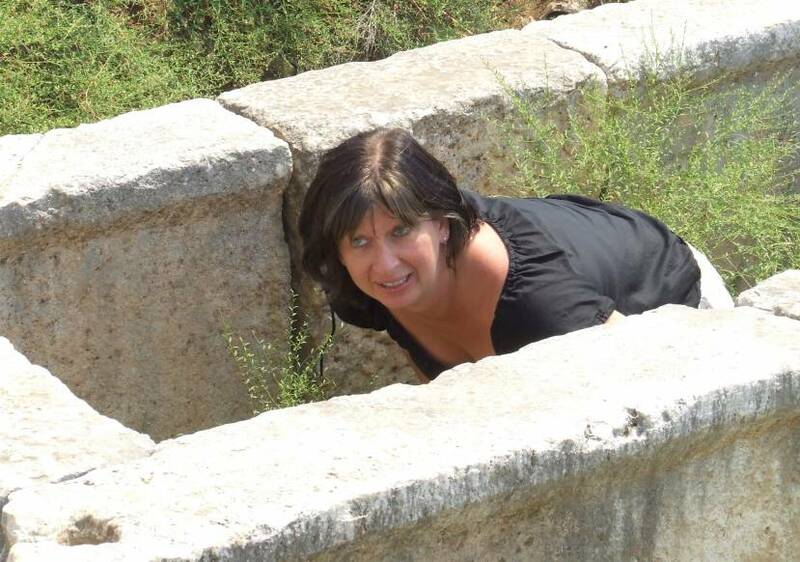 Bev climbed inside an opened tomb but found no treasure. 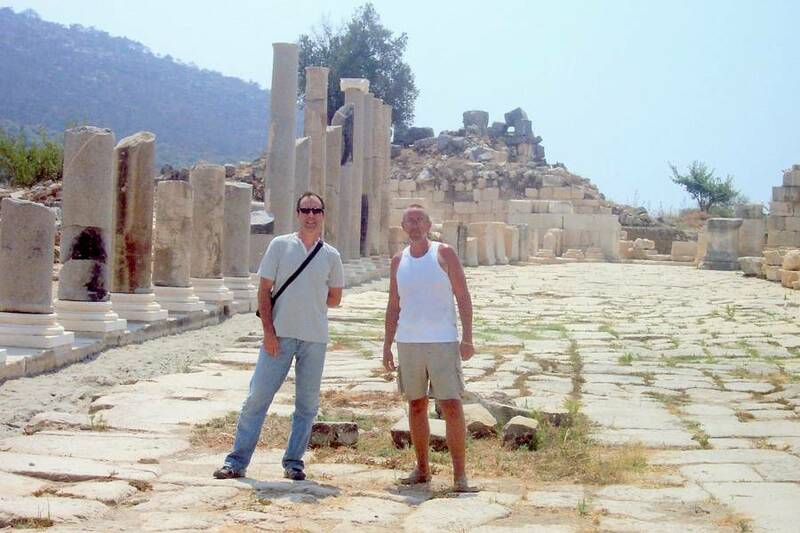 We road the kilometer or so over to the far side of the site to see the parliament building and the ampitheatre. 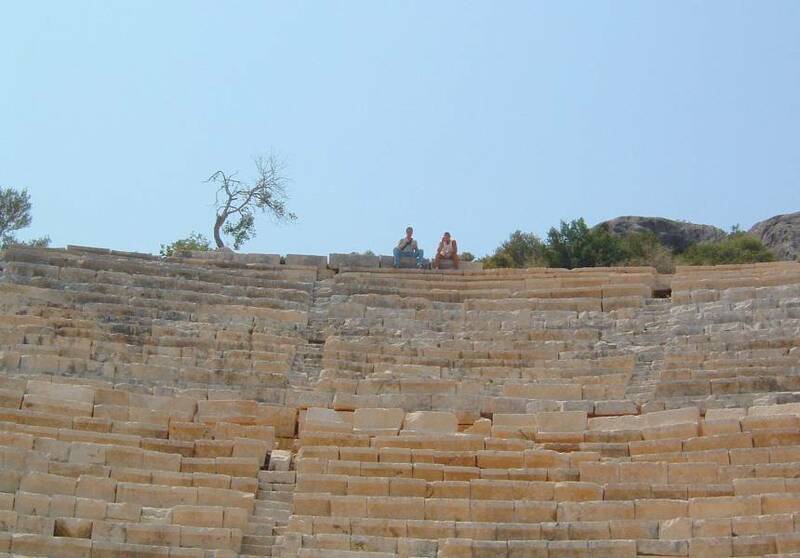 Ian and I climbed all the way up to the top of the ampitheatre, from the very top you can see patara beach, probably some 2km away, also in the distance you can just make out the reacently discovered harbour wall and lighthouse. 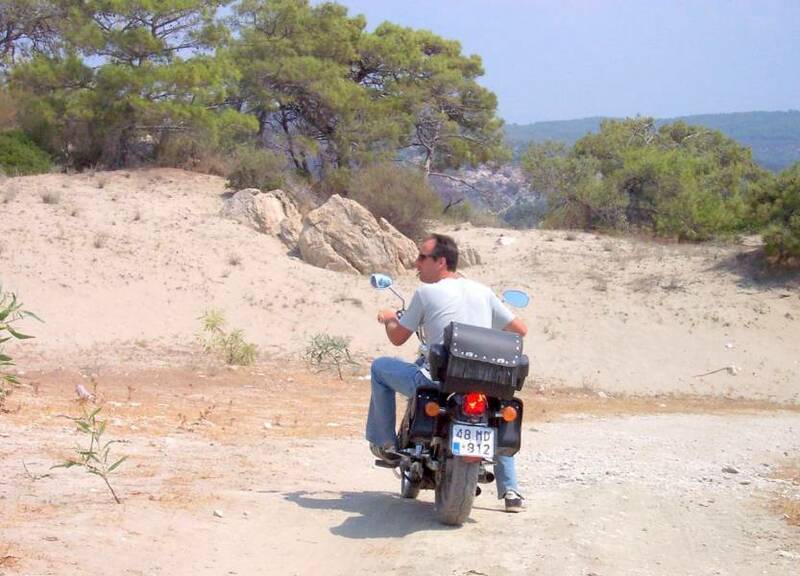 Patara beach is 4km long of perfect golden sand and no tourists because nobody knows it’s here. 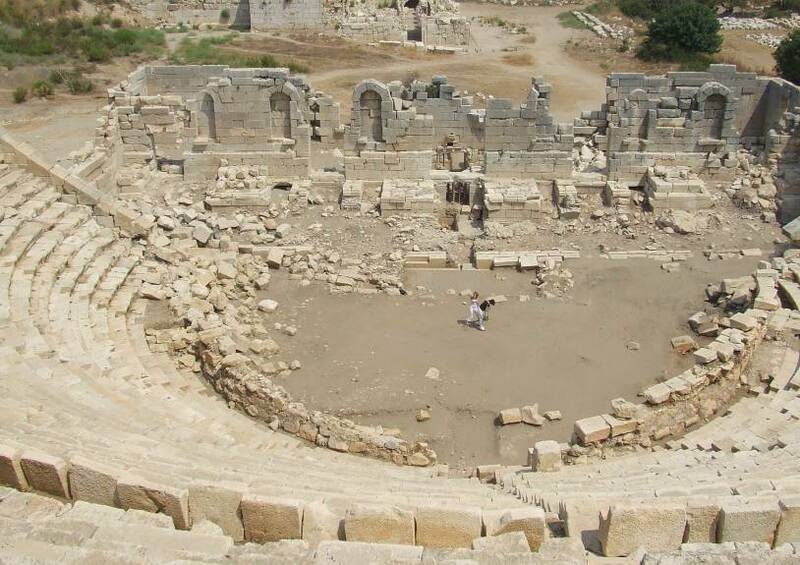 From the top of the ampitheatre we watched as the girls put on a gladiator fight. 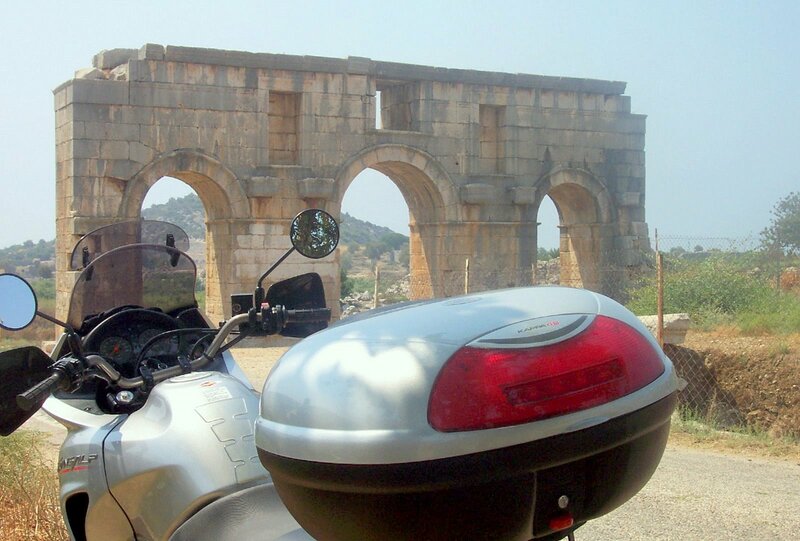 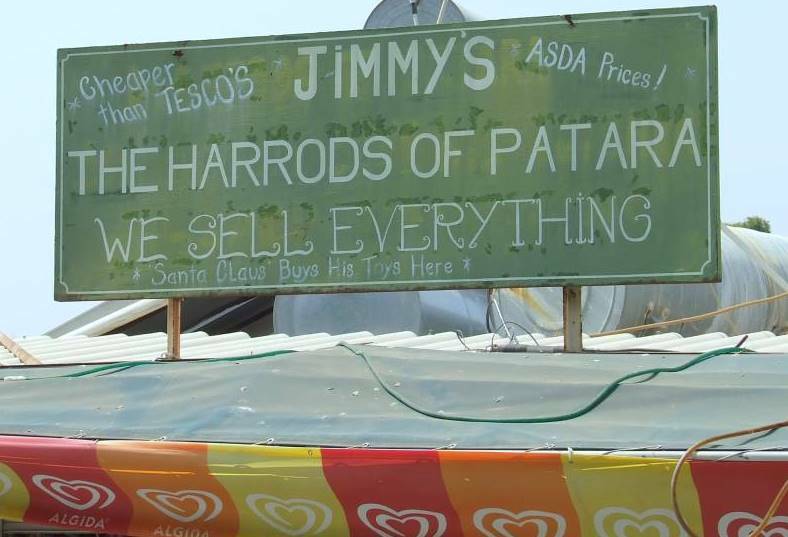 We rode over to the ancient high street where they have reacently rebuilt some of the columbs. 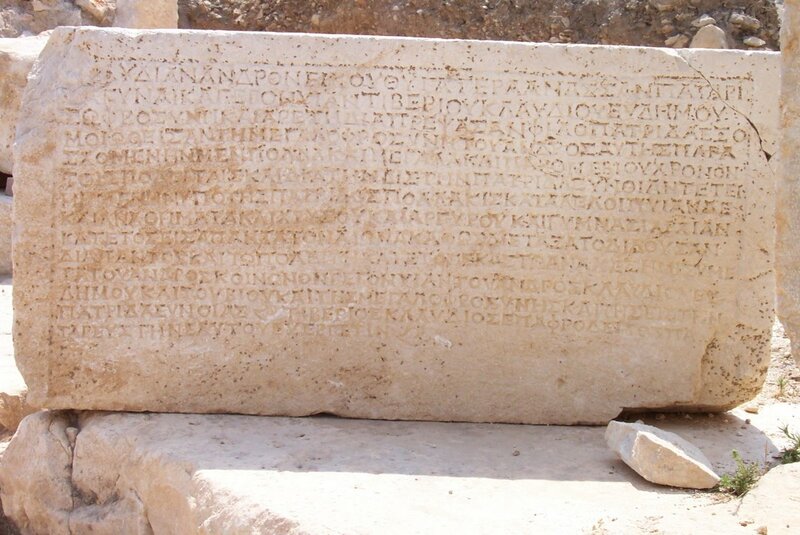 The milenia old writing is clearly visable if you click on this photo and enlarge it. 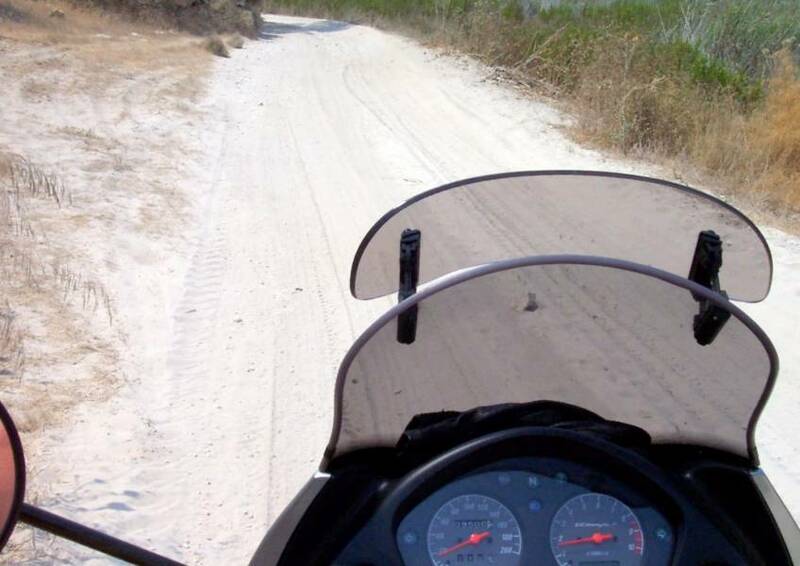 We thought we would see if we could ride the bikes through the sand dunes over to the lighthouse. 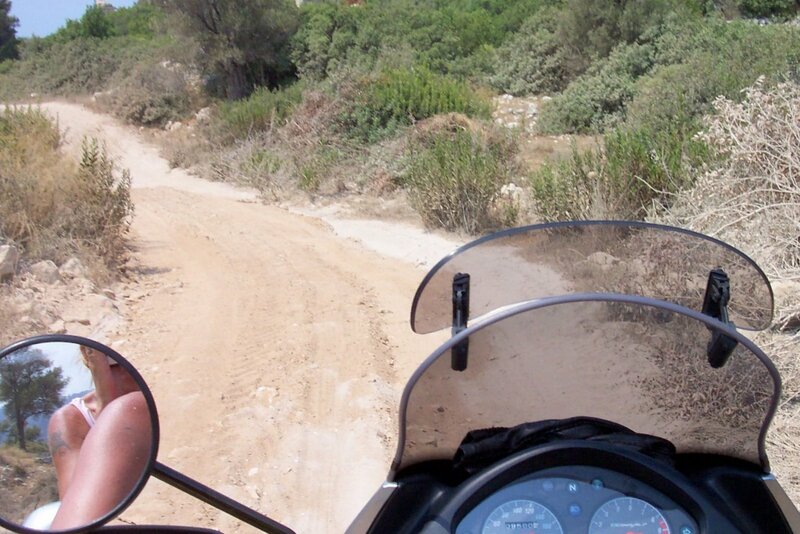 The track was very soft powdery sand which made riding very difficult. 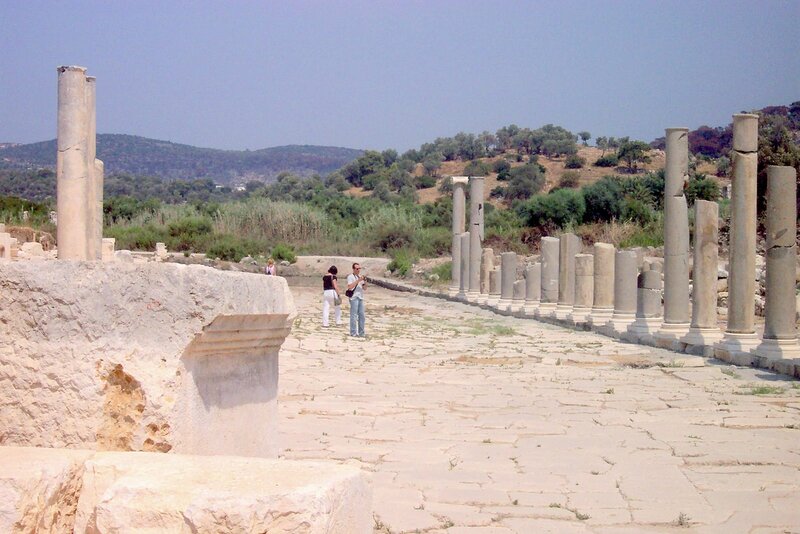 The lighthouse was built by the Roman Emporer Nero and is believed to be the Worlds oldest lighthouse. 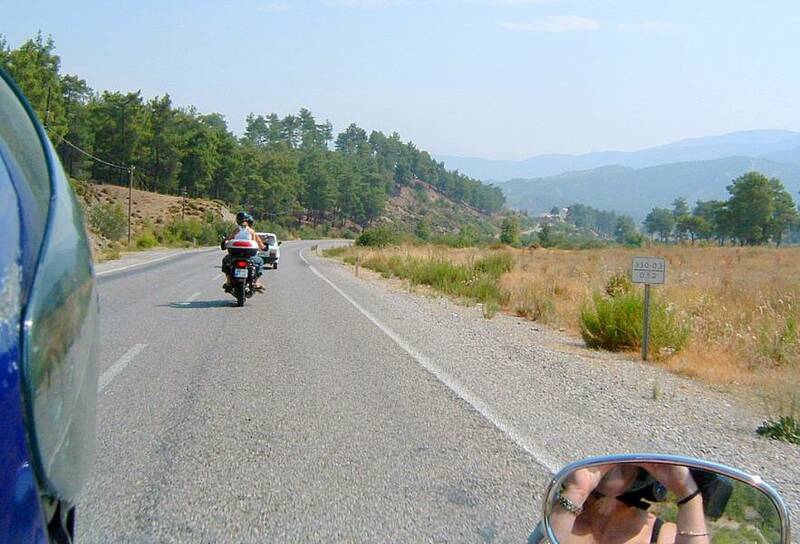 We headed back to the town of Patara insearch of much needed water before heading back to Dalaman. 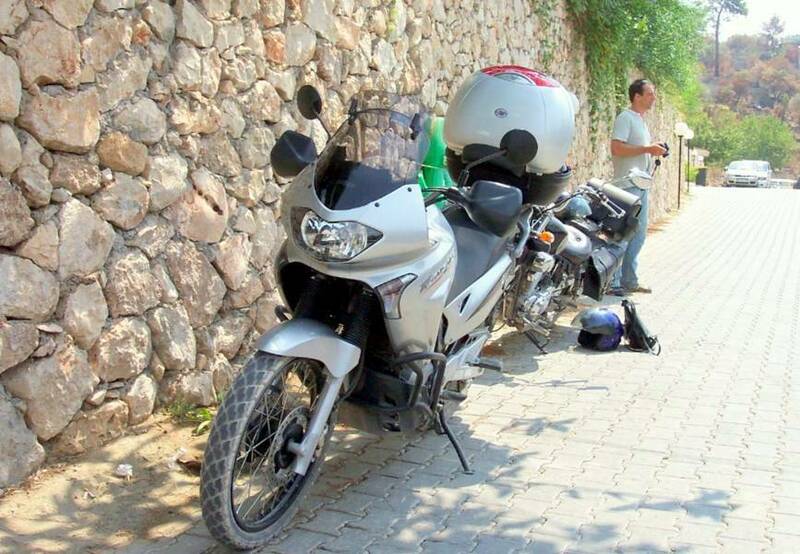 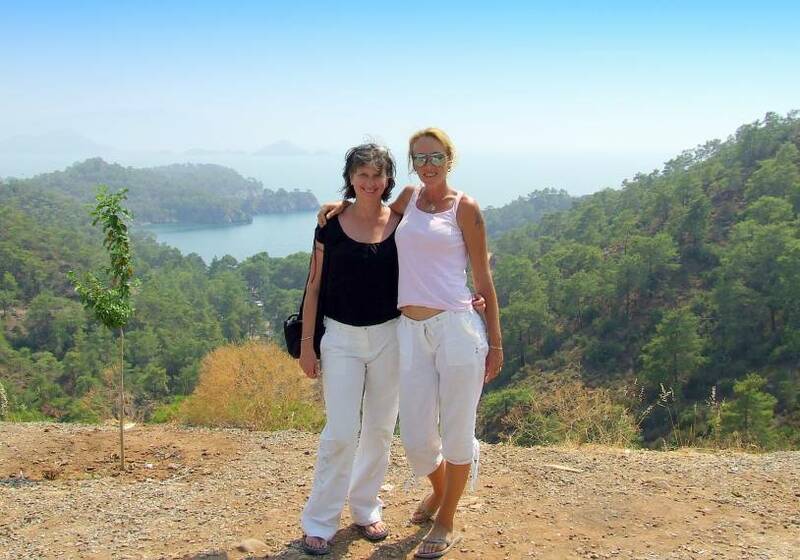 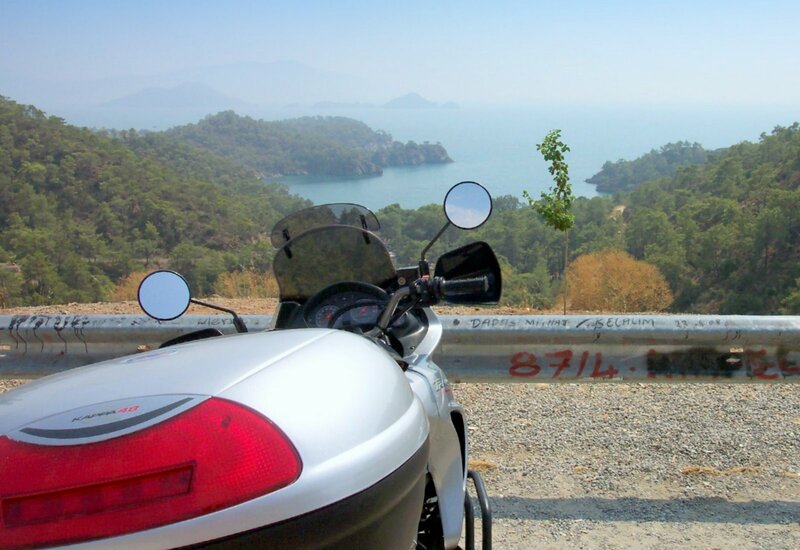 It was a pleasent but hot ride back home and we stopped off at Gocek near Fethiye for a ciggie break. 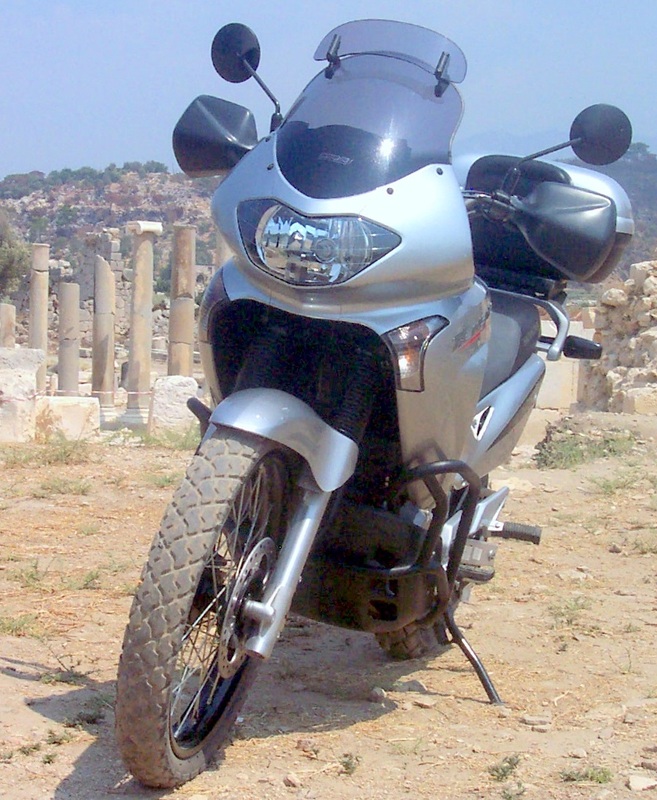 ~ by travelswithmymotorbike on August 26, 2008.